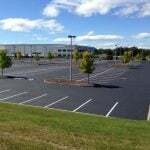 Protecting your parking lot in winter is really important in preserving the integrity of asphalt’s structure. Taking proper measures to prepare your asphalt from the harsh elements of winter and snow PRIOR to winter is the most important thing you can do to protect your lot in winter. Like with many other things, being proactive is always better than being reactive. 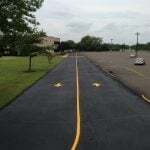 By sealing, crack filling, line striping, patching potholes and conducting all other parking lot maintenance prior to winter, you can help to decrease the damages that winter will inevitably bring to your parking lot. In addition to fall repairs and maintenance, ensuring that you have a snow removal plan in place (that involves a reputable snow removal contractor) is a key component in protection. Plows (mixed with other stressing components of winter like the freeze-thaw cycle) can unfortunately damage asphalt, especially if machinery is sub-par and proper safety measures aren’t taken. 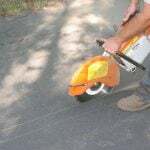 Additionally, make sure that you are not only using deicers and asphalt salts properly, but also the best types for asphalt. While preparation is the most important element in protecting your parking lot in winter, there are also important upkeep/repairs that need to be conducted during winter. One of these important upkeep items is cold patching potholes that occur in winter as a temporary means of protection until you can properly patch it come spring. After winter, your parking lot is inevitably going to need repairs. The most common repair needed following the snowy, cold season is pothole patching and repair. Depending on the severity of winter, your level of repairs needed can vary. After winter, your paving professional can inspect your lot to assess winter damages and suggest/perform the necessary repairs to get your parking lot back in top shape, and as safe as possible. 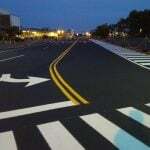 Contact EastCoat Pavement Services for all repair needs!